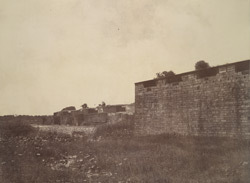 This photograph of a view of the Fort at Tanjore, Tamilnadu, is part of a collection entitled 'Photographic Views in Tanjore and Trivady ' (Madras, 1858) and was taken by Linnaeus Tripe in 1858. It shows a general view of the circular fort looking along the wall and moat. Inside the fort, which dates from the 18th century Maratha period, is the palace built by the Nayakas.